It has almost become a norm for the affluent, celebrities and well placed figures in our society to go to foreign lands, especially the U.S., to deliver their babies so as to earn American citizenship. Recently, famous blogger, Linda Ikeji joined the league of Nigerian celebrities whose children enjoy automatic American citizenship, courtesy of being delivered in the United States. 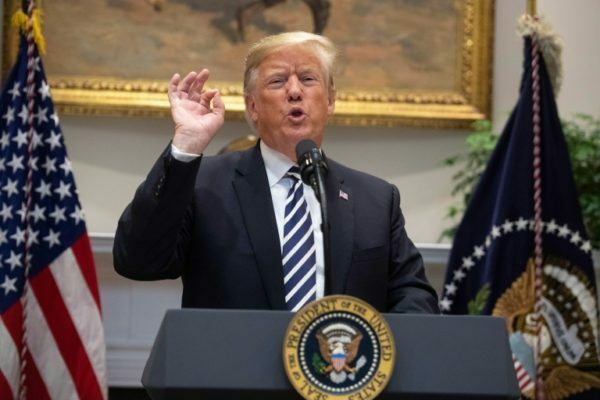 US President, Donald Trump has vowed to issue an executive order to end citizenship by birth, the process by which babies born in the country automatically become citizens. During his latest attention-grabbing tweets before the mid-term elections, Trump sought to sway voters to vote for Republicans by vowing to clamp down on immigrants and end citizenship by birth in the US. “We’re the only country in the world where a person comes in and has a baby, and the baby is essentially a citizen of the United States for 85 years, with all of those benefits. It’s ridiculous. It’s ridiculous. And it has to end,” Trump said in one of his tweets. PMNEWS took to the streets of Lagos to seek people’s opinions on the proposed birthright ban by President Trump. Many Nigerians believed that if implemented, the ban would limit Nigerians as well as citizens of other countries from benefitting from the birthright that comes with delivering a child or children in the U.S.
Mr Olanrewaju Oladimeji, while giving his support to the birthright ban told PMNEWS that it is outright selfishness for people to make their babies in their respective countries and then at the point of giving birth, find their way to the U.S. to deliver their children. On the contrary, Mr Tenny Theophilus is of the opinion that banning the US birthright is not a good one because all migrants, Africans inclusive, built the American economy. He didn’t hide his sentiments as he opined that the U.S is overrated and saddled with a high rate of violence and deaths caused by gunshots, and an increasing rate of insecurity and racism against the black race without adequate punishment. He said: “I prefer to go to Canada on medical tourism where there’s no security threat and I can get a good life with my family without the kind of harassment blacks face in the U.S.
“Since Trump and his wife aren’t full fledged Americans, it is unfair for him to deprive others based on what he uses to qualify citizenship. In other words, since he benefitted from the system, he shouldn’t deprive others,” he stated. Commenting on Trump’s plan, Emmanuel Imariagbe, a sport enthusiast said: ”Economic wise, the decision will be a disaster as cash that could have been spent on utility bills, tourism, hospital bills and develop the nation by the intended parent will now be diverted. ”It will be an advantage to grow Nigeria’s economy instead of channeling these resources to the United States. ”It is also a means to fulfill Donald Trump’s electioneering campaign to stop migrants from taking over jobs meant for Americans,” he added. In his own reaction to the proposed ban, Ovenserhi Airhienbuwa, a telecommunications expert said the policy cannot be implemented in the U.S. because immigrants made America great. ”It is what makes them unique and the laws governing America is greater than the president and cannot be easily abolished,” he added. He said people are already migrating to countries like Canada where there is jus soli, latin term for ”right of the soil” or birthright citizenship. ”Business people migrate to the U.S. and if their children’s future and security cannot be guaranteed, these people will withdraw their investments thereby creating a negative effect on the U.S. economy,” stated. Some countries who give birthright citizenship include Ireland, Argentina, Peru, Uruguay, Canada, Lesotho, Chile, Mexico, Cuba, Venezuela, Trinidad and Tobago, U.S., Gambia e.t.c. The results of the mid-term elections in the United States where democrats now have a majority in the House of Representatives have shown that Trump’s idea to ban citizenship by birth in the US, is unpopular with a lot of Americans. Many Americans see President Trump as too hard on immigrants and have expressed this with their votes against Republican candidates. With this vote, it is hoped that President Trump has received the message and will rescind his decision to ban citizenship by birthright in the US.